Over the years, St George’s has seen a number of Royal occasions take place at the Chapel, all of which are recorded in the Chapel archives, and most recently being the wedding of Peter Phillips and Autumn Kelly in 2008. However, Edward VII is the only monarch to have been baptised, married and buried in St George’s Chapel. He was baptised Albert Edward, Prince of Wales, on 25 January 1842 by the Archbishop of Canterbury. 21 years later, he would marry Alexandra Caroline Maria Charlotte Louisa Julia on 10 March 1863. There had been national outcry at the thought that St George’s would host the wedding, as it was, according , according to The Illustrated Times, “Grey, crumbling, hoary and without almost ruinous in aspect”. The now grand ceremonial west steps at the time were narrow, unkempt and little more than a rubbish dump. 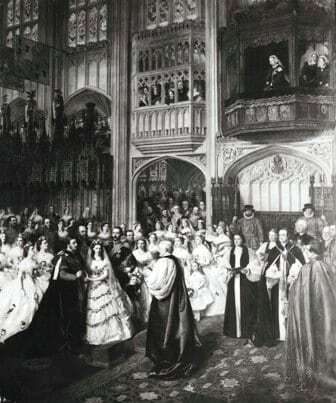 St George’s was also considered too small, and Windsor too much of a backwater to be worthy of the wedding of the Prince of Wales; however as in most things, Queen Victoria got her way. Great anterooms were built over the mound to provide somewhere for the procession to gather, as well as offering something a little more spectacular than what was there at the time. These were hung with fine drapes, and Lady Augusta Stanley thought them “fitted up with the greatest taste”. The day itself was a cold and frosty one, fitting for the air of solemnity and grief which went with the day, since it was less than 3 months since the death of Albert. Despite this, it was a grand occasion, with a gallery at the south end of the organ-loft specially built to accommodate the enlarged choir and an orchestra. Sir George Elvey arranged the music and composed the anthem “Sing unto God”. For Victoria, taking part in the service would have been too much, and she watched from above, as can be seen in this painting. For the rest of her life, she would watch services from this little room, originally built for Katherine of Aragon. On his death in 1910, Edward VII was placed in the Royal Vault while work was finished on his tomb in the South Quire Aisle. After the death of Alexandra 15 years later, the two coffins were placed side by side in the sarcophagus, which has a lovely personal feel, depicting Edward’s favourite dog Caesar at his feet.